This page was featured in the 1986 Kenner Toy Fair catalog. 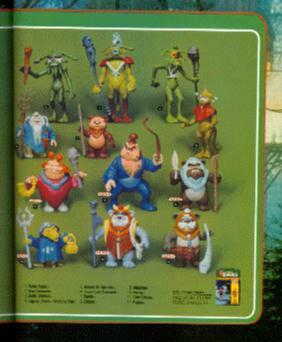 Across the bottom it features (from left to right): Bondo, Chituhr, Weechee, Morag, Chief Chirpa, and Paploo, all of which were never produced. Kenner had planned to introduce these figures in 1986, but as the Ewoks TV show lost popularity, the figures never went into production. There are very few prototypes of these figures in collectors' hands today.